Those of you who think I’m crazy need to meet my friends! Simple, huh?! Sadly though most people, for a variety of reasons from ignorance to pride, don’t and won’t learn from others who’ve succeeded at doing what they want to do! That’s not just sad but it’s incredibly silly! Today or tomorrow, my crazy friend and chief mentor on my vlogging journey, Brian Barczyk, will surpass 1,000,000 subscribers to his YouTube channel. ONE MILLION!!! I want to accomplish what Brian has achieved – namely his positive influence and impact on a hobby and industry he loves and adores! Brian is the leading voice for hobbyists who keep s. If his ONE MILLION subscribers isn’t enough to prove that fact, the videos he’s shared have been viewed, as of today, 104,964,302 times. I’m 11,020 subscribers, 88,200 views, and 19 vlogs in. I’ve got a LONG way to go to catch Brian! But if I want to catch him (and you know I do!) I know the easiest way to do that is simple … follow his lead! Today Brian uploaded his 497th consecutive vlog in a row! For a year and a half straight this madman has posted a unique, educational, and inspirational vlog for his growing fan base EVERY. SINGLE. DAY. Brian has a proven model that other vloggers I’ve been fortunate to meet have successfully modeled as well. 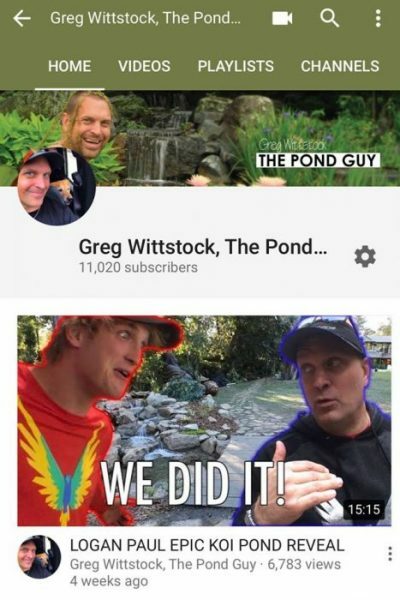 Love him or hate him, you can’t argue with the success of Logan Paul. These guys have shown me the blueprint for success and I’m not too ignorant or too prideful to follow it! In conclusion, the easiest way to be successful in life is to find someone succeeding at doing what you want to do and do what they did. That also means you better prepare yourself for hard work! The common denominator all successful people have is working hard. I’ve discovered the only sustainable way to have the energy to work hard, day in and day out, is to love what you’re doing! I Ponds! I love helping people succeed! And in 2018, I’m going to follow a proven road map to success and share my love for doing what I do EVERY. SINGLE. DAY. I hope this post inspires you to find someone you can follow to succeed in doing whatever it is you want to do. Whether it’s snakes or ponds, it doesn’t matter. Congratulations Brian Barczyk on reaching the ONE MILLION mark. Wish me luck on my year-long quest to follow your lead! Newer Post The College Experience Older Post Are You Entertaining or Just Being an A**hole? !